Bless me father, for I’m about to commit an act of heresy. Whenever I say what I’m about to say, I get a reaction that ranges from raised eyebrows to outright hostility and arguments. But I’ll say it anyway. I don’t like the hashtag chat format on Twitter. 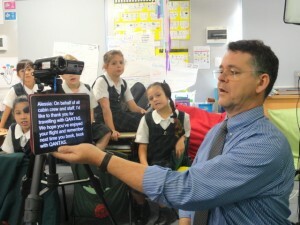 And I don’t like the timed presentation format used for Teachmeets. There. I said it. Maybe I’m just becoming a cranky old man as I get older, but I don’t like either of these formats and for much the same reason. I find they dumb down the conversation. I know that both of these formats are very popular at the moment, and I know that many people seem to like them. But I just can’t warm to them, and I wanted to write this post to explain why. Feel free to condemn me in the comments. Let’s start with Twitter hashtag chats. That’s where you pick an abbreviation, slap a hashtag in front of it, set aside an hour or so, and off you go. Instant “conversation”. I know this form of conversation on Twitter is insanely popular right now, but I just can’t seem to work out why. Don’t get me wrong. 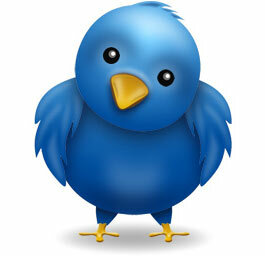 I love Twitter and think its impact on the world has been absolutely seismic. I joined it in early 2007 and have used it regularly since the very beginning. I’ve written a lot of very pro-Twitter posts about how wonderful Twitter is and how important it is that you should be using it too. Twitter is awesome. No argument there. It’s great as a backchannel at events, or as a way of distributing information quickly, or as a tool for building professional and personal connections. It’s a communications medium with self imposed limitations, but if you work within the bounds of those limitations, it’s absolutely brilliant in its simplicity. 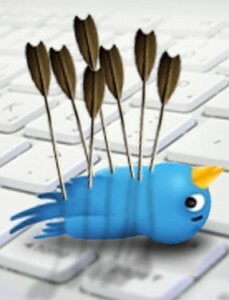 I like Twitter a lot. But as a means for having deep, meaningful focussed conversations on specific topics, I struggle with it. It always feels to me like it’s being wrangled into doing something that it was never really designed to do, and consequently it feels like it does it poorly. Whenever I try to have a meaningful conversation broken up into 140 character chunks (less by the time you include the hashtag, the Q&A numbering and any @replies you might want to include), the “conversation” feels decidedly stilted, fragmented and superficial. I’ve participated in many of these hashtag chats over the years and I always find them frustratingly tedious. I can never say what I want to say in the space I have available to say it, so it ends up getting fragmented into disconnected chunks spread out over time, with no really functional way to reassemble those chunks into some semblance of a real conversation. Hashtags chats usually start out with people saying hi, where they’re from, etc, which takes up the first 10 minutes or so, then the host/moderator throws a question into the ring (Q1, Q2, etc) and everyone has a go at responding with their own tweets (A1, A2, etc). As people respond, then respond to the responses, the conversation fragments even further until there is a confusing collection of truncated half-thoughts littering the timeline, waiting to be mentally reassembled into a thread that hopefully makes some degree of sense. For an hour or so, questions are added to the mix, replies are made, popular tweets are favourited and retweeted, and there always seem to be a whole lot of chatter that ends up in a confused, non-archivable mess. Which is a shame, because the actual ideas that were either poorly expressed, or hidden in that mess of messages, is potentially brilliant. But I think it’s far too much work and far too inefficient to be used like this. I should point out that this hashtag chat idea is not the same thing (to me) as using a hashtag to aggregate tweets around a theme or meme. The latter is organic, and percolates naturally. People can contribute on the hashtag over time, and it is pulled together with a hashtag search query. This feels like a natural use of Twitter. The hashtag chat, on the other hand, where structured questions get sent out to a group for responses in a specific window of time, always feels contrived to me. It feels like a school project, where people are answering questions in response to the moderator, who artificially keeps the “conversation” moving. There’s nothing very organic or natural about it. I’ve tried to give this form of “conversation” a go, but I just can’t warm to it. I know many people who love it, so hey, more power to them. If it works for you, knock yourself out. It just doesn’t work for me. I find I have to dumb down my contributions to stay under the character limit, or figure out how to say something so simply that it no longer conveys the meaning I intended. I end up writing in sound bites that become glib and superficial. And then I get frustrated because I wasn’t able to communicate what I wanted to communicate. I know, long form writing is not what the kids do these days, email is dead and Google+ is a ghost town. Whatever. I’ve been told that anything worth saying should be able to be said in a Tweet-sized package, but I just don’t see it. Some ideas are worth more than that. Which brings me to my second bugbear, the timed “Teachmeet style” presentation where each speaker gets a few minutes to speak and share a tool or idea. (The fact that there is even a “speaker” at what is essentially supposed to be an unconference style event should be the first clue that something is out of whack). For much the same reasons as I struggle with the idea of hashtag chats, I find this is yet another format with a self imposed artificial limitation that can easily ruin the potential value of the content. I don’t know if you recall the historical evolution of this format… the Teachmeet format was originally an unstructured get-together of teachers talking shop and sharing ideas over a few beers at a pub. Then it grew and spread and morphed into a range of formats, until every Teachmeet I go to now uses this same format where each speaker gets a short time limit to share an idea. Originally this time limit idea evolved from the Pucha Kucha style of presenting, but has now grown into being a standard Teachmeet thing. It’s totally unnecessary. The Pecha Kucha style was designed originally to force presenters into a rigidly structured format – half the fun of giving a Pecha Kucha talk is about meeting the challenge of the format while giving an interesting talk. 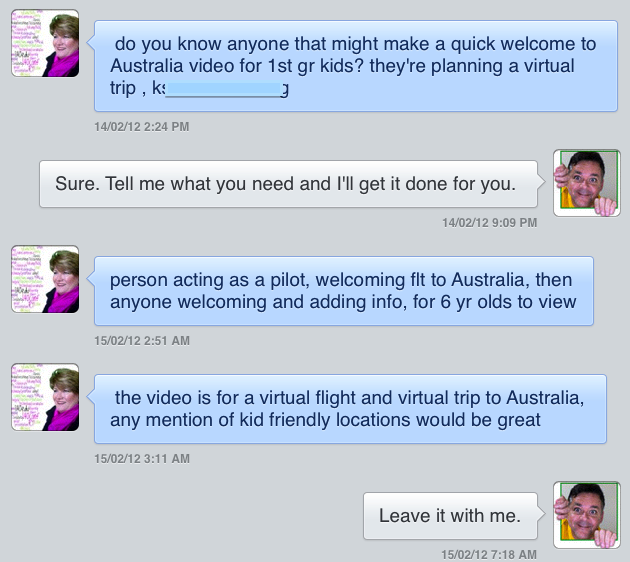 – but there’s really no reason that Teachmeets should continue to do the same. I agree that having some form of “lightning round” presentations, where you get a strictly timed few minutes to share an idea, can be a lot of fun. I think the 3 minutes Demo Slams at Google Summits can be a good example of this. But when every Teachmeet becomes nothing but a series of rigid timeslots, it feels to me like we’ve jumped the shark. Making presenters squeeze their ideas into a few minutes might be good for keeping the program moving, but it can be counterproductive to real conversations and authentic sharing of ideas. Some ideas cannot be distilled down into a soundbite sized presentation. Some ideas take more time, and need an opportunity for questions and deeper reflection. But when the only format for conveying ideas is this kind of short, sharp blast, the only ideas that get talked about are the ones that fit the format. And I happen to think that there are many ideas worth sharing that need more time, more depth and more nuance than either a 4 minute talk or a 140 character tweet can do justice to. I think we are dumbing down the conversation far too much if this becomes the dominant means of sharing. If I’m going to spend time participating in real conversations with other human beings, I want to hear what they have to say, and not just to hear what they managed to squeeze into an artificially limited timeslot. I think we all deserve better than that. I’m know I’m supposed to just agree with the status quo and go along with what’s popular. I’ve publicly stated my feelings about both these formats before and have been told all the reasons why I’m wrong. One of my favourite pushbacks is that sharing in this way is still better than not sharing at all. I think that’s a specious argument. Of course it’s better than nothing, but it’s still no replacement for rich, deep conversations or subtle, nuanced sharing of ideas. I’m tired of the shallowness and the superficiality of these formats. I think we can do better, and we can start by reminding ourselves that some ideas are bigger and bolder than a stopwatch or a character limit will allow. Understand what I’m saying. There is still a place for this kind of rapid-fire sharing, but it should’t be the only place. Right now, every Teachmeet I go to uses this timed format, and the use of hashtag chats on Twitter is more common than ever. By all means, let’s use these formats, but let’s also be aware of their limitations and shortfalls and don’t fall into the dangerous trap of thinking they are the only formats in town. 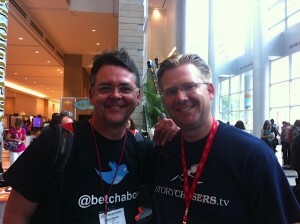 I started on Twitter back in February 2007, joining the service as user number 779,452 using the name @betchaboy. At the time, I thought I was already late to the Twitter party but looking back at it now that the number of users has crossed into the billions, I guess that wasn’t the case. In the time I’ve been part of Twitter, my use of it has grown considerably. As I write this, my Twitter account follows 3,931 people (mostly other educators with a nice mix of others thrown in just to keep in interesting), and there are 8,496 people following me. With over 11,000 tweets since I joined, Twitter has been a big part of my learning for the last 7 years. Twitter has been an incredibly valuable tool of connection and learning, and has enabled me to be part of conversations and communities that I never would have discovered otherwise. Twitter has, quite literally, been life and career changing for me. I’ve written quite a few blog posts about Twitter over the years, some of which have been quite widely read. You could say I’m a fan of Twitter. Twitter had a security breach earlier this year and numerous passwords were compromised, apparently including mine. Now, when I try to access my account on www.twitter.com, it tells me that I have to change my password. Come onTwitter, you can’t be serious! To make things even more bizarre, I can still tweet from that @betchaboy account from devices on which I’ve never logged out since the password problem arose, and which are set to remember my password. I can tweet from my iPad, from the Chrome web app of Tweetdeck and from Tweetbot on my Macbook, all of which I have never logged out of since the problem. However, on new devices I can’t connect, and I can’t connect any app or service that needs to talk to the Twitter API. I find it really odd that I can tweet from existing devices that remember my password (presumably the old password) but that I can’t log in with any new devices. And the fact that I can’t retrieve or reset my password and that I’ve written to Twitter Support six times now, all with no response, is just beyond frustrating. I suppose I could set up a new Twitter account and just start again, but with so much invested into my original Twitter account, I really don’t want to have to do that. My Twitter username, betchaboy, has been very much part of my online identity and digital footprint and I really don’t fancy losing it. And of course, it takes time to develop a large network on Twitter so I definitely don’t want to have to start that process over again if I can avoid it. Twitter, please, can you help me sort this out? I don’t know why the normal reset processes are not working for me. I don’t understand why I can’t get anyone to respond to a support request made through the proper channels. I’m super frustrated by this whole thing, but I really want to get it sorted out. If you know someone at Twitter, could you pass this post on to them? If you have any suggestions, could you let me know. I just want to get it resolved and move on. It’s been a big few weeks. I’m currently writing this while flying in an Air Canada Boeing 777, seat 40J, somewhere just south of the equator and slightly west of the International Date Line, chasing the sun around the globe on my way back to Sydney. I’ve been in Canada for much of the last few weeks, visiting our Canadian family and friends, something I wish I could do more often. 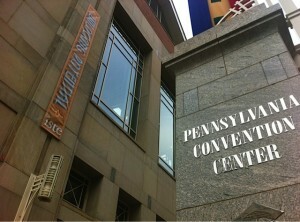 But for three days I managed to slip away down to Philadelphia PA for my first ISTE conference. If you know me, or read this blog at all, you may know that I tend to get around to a few conferences in various places, but the ISTE Conference (and prior to that, a NECC) has eluded me so far. For whatever reasons, I haven’t been able to get to this event so when the opportunity came up this year I jumped at it. 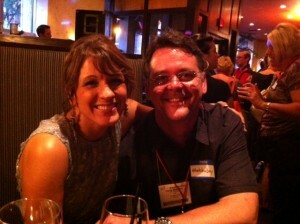 And I’m glad I was able to… it is an amazing event. 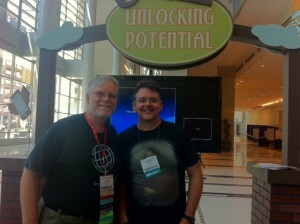 In thinking about ISTE 2011 to decide what to blog about it, there are a few notable things to mention, but for me, one really stands out as the highlight. First, there was the sheer size of it. With (I’m told) 20,000 delegates this year, the scale of ISTE is unlike anything I’ve seen before. Pennsylvania Convention Centre was simply enormous and easily housed the hundreds of exhibitors, vendors, workshops, presentations, displays, poster sessions, and of course, the thousands and thousands of attendees. I don’t know exactly how big the PACC actually is, but it’s huge. Secondly, the number of presentations taking place at any one time was mind boggling. There was so much choice, so many options, it was hard to know where to be. I only attended a few actual presentations, but the quality of the presenters and the information was very good. Whether your interest was in learning about the various edtech tools, in hearing about new pedagogical approaches, or finding out about new ideas for what works in today’s classrooms, there was something for everyone. Some sessions were huge, like the keynotes with 6000+ people, to presentations with a few hundred, to classroom-sized workshops, to poster session conversations; the choice available through the organized sessions was astounding. There were also the fun events too. The Google Party held at the Philadelphia Academy of Natural Sciences, held among the dinosaur bones and the fluttering butterflies, was great fun, and being invited to the invitation only Google Certified Teacher cocktail party beforehand was pretty special. 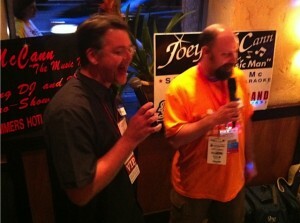 The Edtech Karaoke Party the next night (#etk11), where we all had a few drinks and got up and sang, was one of those events I’m sure I’ll remember for a very long time. 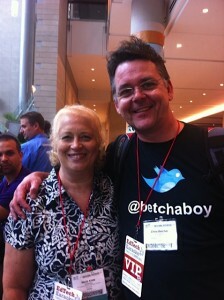 But the thing that really made the ISTE event most valuable for me was the opportunity to meet and mix in person with the people in my PLN. It was, as someone observed, like having your RSS reader come to life. I was constantly bumping into people I knew, whose blogs I read, who appear daily in my Twitter stream, whose YouTube videos I’ve watched. Some I’d met before, but most I had only ever known online. As you’ve probably experienced yourself, the best parts of most conferences are the serendipitous conversations, bumping into people in the corridor, having a chance to chat face to face. 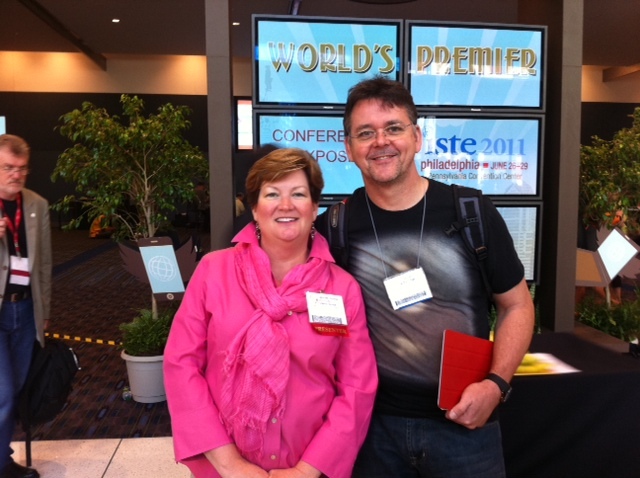 For me, ISTE was all about the people I met. 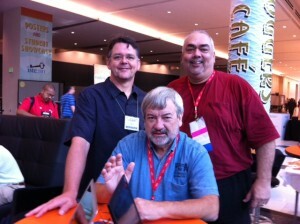 I think it just goes to show that the real power of an event like ISTE is in the people you meet and the conversations you have. That’s where the real connections are made and strengthened. Between the catch-ups with people I already knew quite well – like some of this year’s significant Aussie contingent – through to the folk I have previously met in the past, to the many who I have only ever known through our online connections, meeting in person and having the chance to connect and share and talk was what made ISTE truly priceless for me. Thanks for being part of my network! See you in San Diego next year? PS: If I have missed your name, or was unable to include your Twitter contact, please let me know so I can include it. Judging from the blog comments and the @replies and the RTs on Twitter, it seems that my last blog post really resonated with a few people. Apparently I’m not the only one who sees both the enormous value of Twitter as a social networking tool, and also a level of frustration with people who dismiss it too quickly for all the wrong reasons. Here’s another tip about Twitter than can exponentially improve its usefulness. But be warned it’s a little geeky, and if you want to set it up for yourself it will require a certain level of technical know-how. But if you can work it out, it opens up lots of possibilities for Twitter power users and anyone who just loves playing with data. The tool is called ThinkUp, and is an open source project led by Gina Trapani (who some of you might recognise as the founder of LifeHacker, and a regular guest on the TWiT network’s This Week in Google). Among other things, Gina is a web developer who’s been working on building tools to help mine the wealth of information that flows through the tweetstream. To install ThinkUp you need access to the back end of a webserver and the ability to set up and connect PHP pages with a MySQL database. You’ll need to be able to manage the database access and FTP files onto the server, so this is probably not the sort of thing you should try unless you run your own (or a hosted) server. But if you can get it set up, it’s pretty interesting. ThinkUp connects to your Twitter account using all the usual APIs but then tracks, monitors and archives a copy of your Twitter activity into your own database. If you take Twitter seriously as a tool, this is important because you normally have no way to permanently archive and capture your own Twitter activity. It normally resides on Twitter’s servers and is fairly ephemeral – once a Tweet is gone it’s gone, or at least it’s usually too hard to retrieve. Finding a Tweet that you wrote, or the responses you might have received to it, can be difficult once the moment has passed. Trying to dig up a Twitter conversation from six months ago can be near impossible. What ThinkUp does is to archive and organise your Tweets in your own database and provide you with tools to make more sense of them. One of the most useful things is to aggregate the replies to a question I may have asked on Twitter. Here’s an example… I recently sat in a meeting at school where we were talking about the challenge we were facing with kids keeping their laptops charged, and someone asked “I wonder how other schools handle this issue?” While sitting in the meeting I Tweeted out the question and within minutes the replies started to come back in from all over the world. The next day I had about 20 replies to the question, and while those replies were useful, the way Twitter normally works makes those replies hard to see in aggregate form – they were scattered all over the previous 24 hours of the public Tweetstream. With ThinkUp however, the replies to the original question can be brought together in one place, providing an easy to read Q&A type page with it’s own URL. Thanks to Twitter I was able to get a broad range of responses to the question, but because of ThinkUp I was able to get a clearer insight into what that response thread was actually trying to tell me. It also gave me an easy way to share that insight with my colleagues via a single URL. Next to each tweet are numbers to indicate how many times it has been replied to or retweeted. Clicking on the number takes you to a page listing all the details. On some pages you can even see a Google map that show the geographic locations of where each tweet originated (I’m having a bit of trouble making this bit work on mine but it’s a neat idea!) Update: It’s mostly working now! As you can see, over time you’ll end up with an enormous amount of data in there. But because it’ all now in your own database, that YOU manage, you have full control over it. As you should… after all, it’s YOUR data. But what makes it all so much more useful is the way you can mine this data for meaning, because it’s in the mining for meaning that real insight about the data starts to emerge. You can find my own ThinkUp page at http://chrisbetcher.com/thinkup. If you want to try ThinkUp for yourself but can’t install it on your own server, just make yourself an account on mine (by clicking the Log In link then click Register.) I’ll leave the site registrable for a few days for anyone who wants to try it out. One of the things that my American friends are always very proud of is that they claim to live in a country where dreams can come true and where everyone has an equal opportunity of success. They call it “The American Dream” and all over America young children are told that anyone – even them – has the opportunity to grow up and become president one day. Of course, if you’re a young American, the reality is that while anyone can potentially become president, the probability of it actually happening to you is somewhere around 1 in 307,006,550 (which is roughly the number of people living in the USA at the moment). So while you possibly could become president, it’s far, far, far more likely that you won’t be! If you did happen to somehow end up as the President of the United States, the odds get even more staggeringly unlikely that your son or daughter will also become president. Mathematically, the chances of two people from the same family both becoming President of the USA are around 1 in 9.42530217 × 1016, or, as my math teacher friend Darren Kuropatwa likes to call it, zero. While both people may have the same opportunity as anyone else, the statistical likelihood that two people from the same family will both end up holding the office of president starts to become so unlikely that you might as well call it impossible. Yet, we all know that this has indeed happened in the past. George Bush Sr held the top US job between 1989 and 1993, and then his son George W Bush held the same position from 2001 to 2009. The odds of two people from the same family both reaching the office of President are very, very unlikely, yet it happened. And this is not the first time it’s happened. Back in 1797, John Adams earned the US presidency and then his son John Quincy Adams took on the same position in 1825. And let’s also not forget William Henry Harrison, who became president in 1841, and then 41 years later so did his grandson Benjamin Harrison. What’s going on here? How can something so unlikely keep happening multiple times? It’s not just politics either, it happens in other fields of endeavour as well. In sports, the Williams sisters, Venus and Serena, have done a similar thing, with both of them being ranked as the number one female tennis player in the world at various times. The statistical likelihood of getting to be the world’s best at anything may seem unlikely, but the chance of two from the same family should be nearly impossible. Australian readers will remember the Waugh brothers who played cricket for Australia back in the 90s. Like becoming president, becoming an elite athlete is hard work and requires a great deal of focus, dedication and effort. Rising to a world class level is highly competitive and although many try to get there, few actually do. And yet Mark, Steve and Dean Waugh bucked the odds when all three brothers from the same working class family in southwestern Sydney ended up representing their country in cricket. The chances of one of the brothers playing cricket at the elite level is slim, but you’d imagine that the chance of all three of the boys doing it would be near impossible. And yet, these things do actually happens far more often than you might think. You don’t have to look too far to find plenty of examples of people from the same family, group, team, organisation or school achieving significant unlikely success together. If you just look at it from the perspective of statistical probability, getting multiple people from the same family or group or school to succeed at a high level might seem unlikely to happen, and yet it does happen with surprising frequency. So what’s going on here? Are some people just in the right place at the right time? Are they just lucky? Or is there something else going on? When you stop and think about it, it actually makes a lot of sense. Although it may seem almost paradoxical at first, the notion that your own performance can be raised up by the associations and connections you create with those around you in the same field is really not all that surprising. 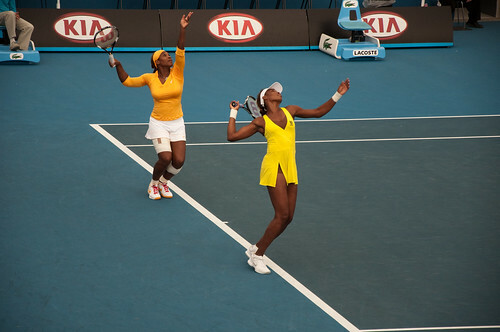 When Venus improved her game, it probably spurred Serena on as well. When Serena learned to improve her serving technique she probably passed on some of that learning to Venus. Being around other people who are achieving excellence doesn’t reduce the likelihood that you’ll learn from them, it dramatically improves it! If you know someone who has reached the top of their chosen field, and you spend a lot of time with that person, it usually makes it more likely that you will succeed, not less. You get to share their passion and their enthusiasm, which often drives your own passion and enthusiasm forward as well. You get to learn from them, which helps you avoid some of their mistakes while benefiting from their experience. You can get caught up in their competitiveness, which often drives you to be better, to try harder, to practise a little longer. Despite the apparent odds of more than one person succeeding at an elite level, it would seem that associating with like minded people who share your passions dramatically improves your own chances of success. As any sports star will tell you, the best way to improve is to regularly play with other good players. How does this principle apply to you as an educator? What are the associations and connections you surround yourself with? Who are the people you associate with and learn from? How do you get to be part of an “all star team” that can drive your own learning and professionalism forward? I’d suggest that the analog for committed educators is to development a strong Professional Learning Network, or PLN. I’m sure that those of us who are connected through tools like Twitter, the blogosphere, Skype, etc, can attest to the remarkable difference it makes. Not just a little bit, but an enormous amount. Being connected to the right people, being part of the right networks, sharing ideas and conversations with the right people… I would rate the idea of being a “connected educator” as the single most crucial thing you can do for your own ongoing professional development. This all struck me as I was sitting in a meeting in Melbourne today with a group of leading Australian teachers. Many of them I consider to be some of the best educators I know. Many have enormous wisdom about teaching, about learning, about education, about schooling, about educational technology, about being an effective and fluent citizen of the 21st century. In short, these were a bunch of fine educational minds. 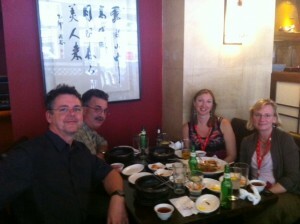 At one point, it was noted that although many of us had never met in person before, we already shared many connections and the fact was cited that nearly all the people in the room were active members of the OzTeachers List (one of the longest running and most active educational online communities in the world). Someone commented that it was quite a coincidence that, in a room full of leading educators, so many were all OzTeachers members. To which I would respond, it’s not a coincidence at all. In fact, it’s more likely the whole reason we were there in the first place. This was not a room full of random teachers who, surprise, surprise, all happened to belong to the same online community. Out of this “random” group of teachers, virtually everyone there could claim to be part of numerous shared networks of connection; ADEs, GCTs, Edubloggers, Classroom 2.0ers, Twitterers… The room was full of people who already knew each other from online networks. Coincidence? I think not. This was a room of teachers who were already connected in numerous networked ways, and it was undoubtedly these connections that were the very reason they were asked to be there in the first place. It’s through being connected, belonging to shared communities of practice and being part of each other’s professional learning networks that makes leaders, not the other way around. It drives me crazy when I meet teachers who continually resist the idea of belonging to online networks of like-minded educators. Like so many others in that room in Melbourne (and around the world in many other networks of connection) I know the undeniable value of being connected to others, of sharing ideas, of speaking a common language. I know what an amazing difference it makes when you expose yourself to a steady stream of innovative ideas, resources and people. Being connected to other passionate people exposes you to more good ideas in a single day than most unconnected educators will stumble across in a year. I honestly believe that being connected to others is the single best thing you can do for yourself and your own professional growth. As Steven Johnson says, “Chance favours the connected mind”. So if you’re already a connected educator, congratulations… I’m sure you can attest to what a huge difference it makes in your own professional life. If you’re not, then maybe it’s time to finally bite the bullet and do it. I’m sure Venus and Serena would agree.